Voices around the state and prominent education officials are calling for Michigan to lengthen its school year and increase the amount of time students spend in class. Unfortunately, this type of reform is misguided since there is no correlation between the amount of time students spend in school and their level of achievement. Michigan instead should focus on implementing reforms that have track records of improving student achievement. 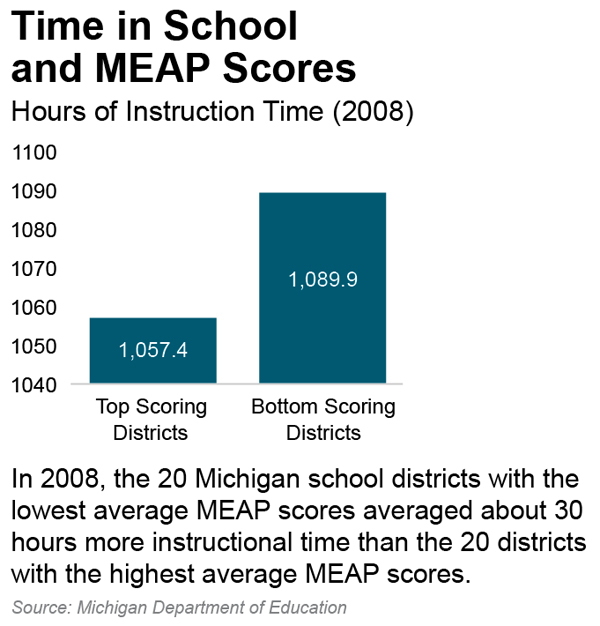 The Michigan Educational Assessment Program (MEAP) gauges student performance. Comparing the number of days a school district is in session and its performance on the MEAP test produces interesting results. These results show that there is no statistical relationship between the length of time a school is in session and student performance. 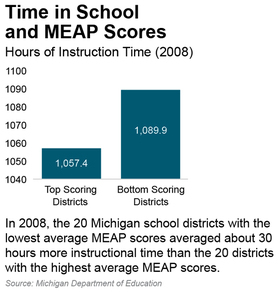 In fact, during the 2007-2008 school year, the 20 districts in Michigan with the lowest average MEAP scores averaged 30 more hours of instructional time than the 20 districts with the highest average MEAP scores. Looking at other measures of success produces similar results. For instance, high schools with more days on their school calendar do not produce higher graduation rates than those with fewer days. Measuring the effect of teacher performance on student achievement produces significant findings. International analysis yields similar results. It is true that some countries, such as Korea and Japan, average more than 200 days of school per year and consistently outscore the United States on tests like the Programme for International Student Assessment and the Trends in International Mathematics and Science Study. Several other countries, however, average fewer school days than the United States and still score higher on the same tests. Analyzing international standardized test scores and average number of school days produces the same result that exists in Michigan: There is no relationship between the time students spend in school and their academic achievement. Even historical comparisons suggest the same conclusion. According to "Market Education: The Unknown History," by Andrew Coulson, in 1909-1910, the average American student spent 113 days in school. By 1969-1970 that average had climbed to 161 school days; today that number is approaching 180 days. This means that the high school graduates of today are in class for what amounts to more than four additional school years — at the 180-day school year level — than graduates of 1910. What has been accomplished with those additional years of schooling? Not much, considering that the average reading score for a 17-year-old is 12 points below a level at which "readers can understand complicated literary and informational passages, including material about topics they study at school," according to the 2008 National Assessment of Educational Progress report. The cost of lengthening the school year also should not be ignored. There are few reforms that would cost districts more than mandating they increase the number of days in their school year. Minnesota debated expanding its school year by 25 days. The debate ended when the estimated costs for the state came in at $750 million. In fact, studies estimate that increasing school time by 10 percent increases costs by 6 to 7 percent. With school districts around Michigan scrambling to reduce overspending, forcing them to increase their costs would be fiscally irresponsible. The discussion in Michigan should be about reforms that are financially prudent and can improve student achievement. Instead of focusing on the amount of time in class, we should focus on the quality of the time in class. There are curricular, administrative and technological reforms that save money and improve student achievement. Of these school-based reforms, the most powerful in bolstering student performance is better teacher quality. Measuring the effect of teacher performance on student achievement produces significant findings. Research has shown that students with high-quality teachers can gain 1.5 grade-level equivalents in one school year. Students with low performing teachers achieve only half a grade level in one year (see "A Teacher Quality Primer"). Differences in teacher quality correlate directly with student achievement. For Michigan education to improve, less time should be spent debating how many hours a school keeps its lights on and more time figuring out ways to attract and retain high quality teachers. Michael Van Beek is director of education policy at the Mackinac Center for Public Policy, a research and educational institute headquartered in Midland, Mich. Permission to reprint is hereby granted, provided that the author and the Center are properly cited.